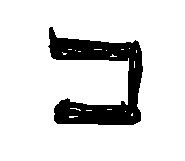 hi, what would be the din of a beis with a very minute eikev, and roundish , such as the picture here. I have some cheap mezuzos with such beises. This still looks kosher, although poor quality. Kasher as it is + the majority of poskim don't require us to show it to a tinok. Nevertheless, its good to enhance the heel. I agree with R' Attia. Firstly, it has a blita at the top, and an eikev at the bottom right, so I don't see why it would be a shaalot tinok. You can add ink to the eikev and make it more mehudar. Kasher but would be good to improve the ekev as everyone is saying. Havchanot Tinok is only for cases of genuine safek and it is fairly obvious it is a bet. However, if the bet is so poor on all these 'cheap' mezuzot, one wonder what else is wrong with them? I've actually fixed a Torah in the past where all the bets were similar to this and added an ekev onto all of them so I don't envy you going through all those mezuzot! But as 'aaa' says, don't assume they are all the same and each should be dealt with in turn.